Mark Daigneault (DAYG-nalt) enters his fifth season as head coach of the Oklahoma City Blue. During the 2017-18 campaign, the Blue made its third playoff appearance in four season with Daigneault at the helm after finishing the regular season at the top of the Midwest division and rankinng third in the Western Conference. The Blue wrapped up a franchise record-setting season in 2016-17, tallying a franchise-record 34 wins, finishing as the regular-season Western Conference Champions and advancing to the Western Conference Finals for the first time under Daigneault. In 2015-16, Daigneault joined Billy Donovan’s Thunder coaching staff midseason on Feb. 17 in place of Thunder assistant Maurice Cheeks, who was sidelined for six weeks due to hip surgery. Daigneault remained with the Thunder for the conclusion of the 2015-16 season and entirety of the Thunder’s postseason campaign to the Western Conference Finals. In his first season at the helm of the Thunder’s NBA G League team, Daigneault led the Blue to a 28-22 record and an appearance in the NBAGL Western Conference Semifinals. Under his watch the past three seasons, the Blue has seen six players called up to NBA rosters (Daniel Hamilton, Dakari Johnson, Semaj Christon, Josh Huestis, Dwight Buycks and Reggie Williams) and seven Thunder players assigned (Dakari Johnson, Terrance Ferguson, Semaj Christon, Grant Jerrett, Josh Huestis, Mitch McGary and Cameron Payne). Daigneault came to Oklahoma City after spending his previous four years working under Donovan at the University of Florida, where he most recently held the position of Assistant to the Head Coach. Throughout his four years at Florida, the Gators totaled a record of 120-30 (.800), won three SEC titles and advanced to the Elite Eight each year. Prior to his time at Florida, Daigneault spent three seasons as an assistant coach at Holy Cross. During Daigneault’s tenure, the Crusaders finished as runner-up of the Patriot League Championship in 2008-09. A 2007 graduate of the University of Connecticut, Daigneault served as a student manager with the Huskies under Jim Calhoun from 2003-07. A native of Leominster, Mass., Daigneault holds a master’s degree in sports management from the University of Florida. came to Oklahoma City in 2015 following a one year stint as a assistant coach in Lyon, France with Asvel Lyon-Villeurbanne Basket. assurance assistant during San Antonio’s 2013-14 NBA championship season. He began his coaching career in 2012-13 with the New York Knicks in the role of coaching workout associate. Following a collegiate career at Adelphi University in New York, Akinyooye played one season with the Springfield Armor of the NBA G League. A native of Elmont, N.Y., Akinyooye received a Bachelor of Science in Communication from Adelphi in 2011. Taj Finger enters his second season as an assistant coach of the Oklahoma City Blue. Finger served as a graduate assistant for the Georgia Tech men’s basketball program for the 2016-17 season, helping guide the Yellow Jackets to their first National Invitation Tournament championship game in 46 years. A member of the Stanford men’s basketball team from 2004-2008, he appeared in 126 games, earning three trips to the NCAA tournament, including an appearance in the Sweet 16. Finger was also selected to the Pac-10 All-Academic team three years in a row. The New York native graduated with a degree in Communication and Media Studies in 2008 and went on to play professional basketball overseas for five years in three countries. Grant Gibbs begins his second season as an assistant coach of the Oklahoma City Blue. Gibbs came to the Blue after a three-year international playing career. A native of Iowa, he played in the Netherlands and Germany after graduating from Creighton with a degree in journalism. Gibbs began his collegiate career at Gonzaga then transferred to Creighton after two seasons with the Bulldogs. He played in 100 games and averaged 7.6 points and 4.9 assists as the Bluejays appeared in the NCAA tournament in each of his seasons with the team. 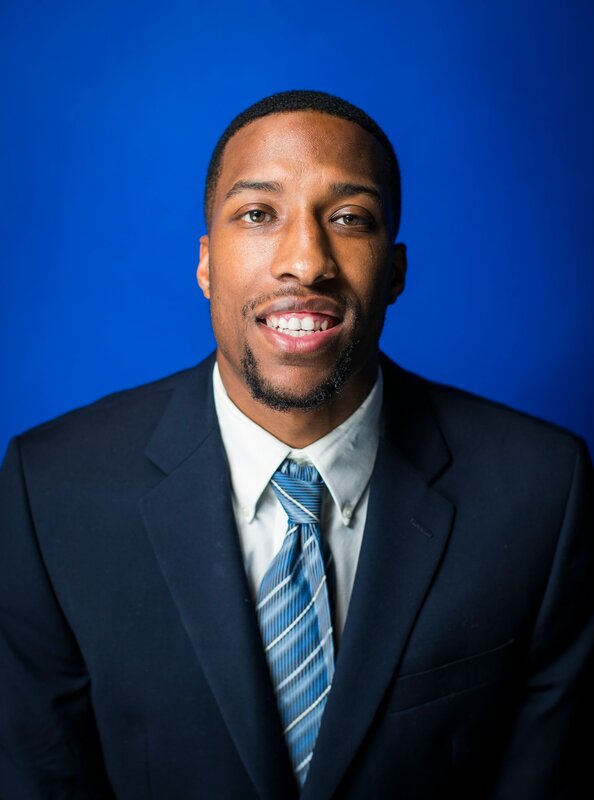 Kameron Woods returns to Oklahoma City for his first season as an assistant coach. He previously played as a forward for the Blue for two seasons. In his career, Woods played in 99 games (43 starts) and averaged 4.6 points and 4.9 rebounds in 23.7 minutes per game. A Butler University product, Woods finished his four-year collegiate career as the second leading rebounder in the school’s history with 956 rebounds. He led the Bulldogs in blocked shots in all four seasons.